A friend asked me what was the best way to attract pollinators to her garden. She was thinking about getting a honey bee hive or maybe just attracting native bees. Firstly I have to say I was surprised how much difference it made to my garden after we moved a couple of beehives right next to it. Suddenly I had capsicums and pumpkins growing where I never had success before. Thinking back, I hardly ever saw honey bees in my garden, which means we don't have any wild hives or beekeepers close to us. I did used to see all sorts of other pollinators, but they must not be as efficient or as suited to vegetable pollination. 1) find a beekeeper who needs somewhere to put hives, honestly you should not have to pay for this, someone will appreciate having somewhere to put them (we are always looking for good places to put our bees, particularly if you have lots of trees or other sources of nectar nearby), but you will need to be ok with them visiting every few weeks in spring/summer to check the hive. And they might give you some honey. 2) native bee/wasp hotel - this is for solitary bees and wasps (they just lay a few eggs in holes in wood and the new insects hatch and forage near the hotel, providing both pollination and pest control as some of them eat caterpillars too) and it does help to attract pollinators if you give them somewhere to live. 3) native stingless bee hive - there are three species of Australian native bees that build colonies like honeybees. They prefer warmer temperatures, so you'll only find them in Queensland and northern NSW as far as I know. They have a queen (or several) and live in hollow logs etc. They don't fly very far, so if you've seen these in your garden then you already have a wild hive nearby. You can buy hives at around $200-300 for a tiny box of bees. If you don't want your own honey beehive, then I think the cheapest and most effective option is to make habitat for wild pollinators that you don't have to look after or pay for. As long as you provide lots of flowers all year for them to feed on, shallow water sources, habitat (bee hotel, hollow logs, trees etc), no spraying of chemicals, they should come into your garden naturally. The options above will boost numbers if you feel that you still don't have enough pollinators. What do you think? 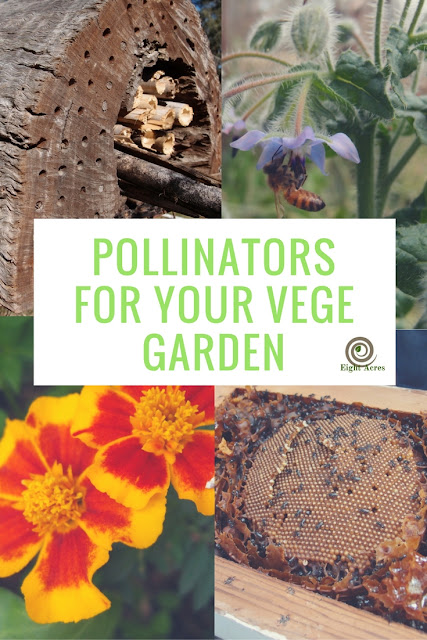 How do you attract pollinators to your garden? Liz we have so many bees buzzing around the garden. There seems to be certain flowers they are especially attracted to and they go crazy for the flowers of palm trees. We've never had too much trouble attracting bees with the vegetables that we grow in our garden every year, but we've added a row or two of buckwheat throughout the garden and they LOVE it! Well worth the expense, and you can save the seeds and grow again and again. I always get very excited to see the bees. They are just starting to show themselves now, after such super wet winter and early spring. I have lots of flowers, like lavender, calendulas, yarrow, all sorts that bees love. I haven't made a bee hotel yet, but am thinking of it. We have lots of flowering plants that attract bees. The previous owners planted lots of natives which they seem to love! Our native rosemary bushes next to the vegie patch are alive with bees and I have lavenders, calendula and other flowers among the veggies too. Next step is to make a bee hotel. I think having flowers either in or near your veggie patch is really important. We have two large hives and where once I was wary of them now I plan my gardens FOR them. Lots of flowers and bird baths with pebble sin them for bees to drink safely. We also mow very little, only a small area where we eat outside, the rest of our "yard" is pasture or native grasses grown wild. Nature is messy and we have learned to live within it rather than always trying to tame it like so many other American farmers insist on doing. I just stopped mowing the lawn and let all the clover flower....bees everywhere! Happy. I agree with Donna. I was walking down the lower gully just yesterday with plenty of overgrown areas. I thought the blowflies were bad this year, for how loud their buzzing was. But I also knew we didn't have a lot of livestock (only chickens) and none were located down in the gully. Observing a little more however, I noticed they were native bumble bees and all kinds of wasps, flying low to the ground. Some weeds had gone to seed, attracting some, there was plenty of newly felled, damp wood on the ground, attracting others (bee hotel) and some even nest in soft soil. I've noticed one particular variety (The teddy bear bee) does this. Technically we don't have native bumble bees in Australia, but they sound an awful lot, like them and are quite sizeable. Hence, the comparison. So along with all the recommendations already made, I would add the necessity to allow the landscape to remain fallow, with as little disturbance as possible. Mow your pathways, and leave the rest to nature. When any of your trees and shrubs lose branches, place them on the ground in your garden beds. It will mulch your garden and provide a place for native bees to set up house. I was AMAZED how thick the native bees were, and so loud, I thought I had a horde of blowflies. That part of our garden, we touch the least though. No fancy flowering plants. Just the regular weeds.